You will love this crazy energetic book by a refreshing new talent! Tesana has never really fit into anything before but her daydreams. But when making an attempt to connect to her peers by joining in a pep rally planning committee she suddenly discovers a little white rabbit that lays brightly colored eggs. Realizing that she may have found the real life Easter bunny, Tesana embarks on an epic quest in an effort to get him back to his natural habitat and into safe hands. However as she progresses on her fanciful journey she gains more and more undesired attention until the quest becomes an increasingly madcap race to stay ahead of greedy pursuers and find a safe place for her new friend…wherever that place may be. It's Tesana against the world! "Recommended. Brings a fresh look to the genre with dark humor and the realistic dreams of any young person struggling to fit in." "Thoroughly enjoyable entertainment. 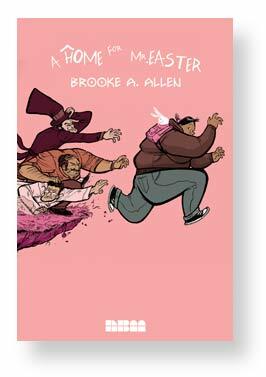 The artwork is energetic with a rock-solid understanding of cartooning and kineticism … with an unusual protagonist and showcasing a quirky new voice in comics." "A Home for Mr. Easter is defined by its chaos. Tesana feels attacked on all sides, and then she actually is. The plot follows the logic of a dreamer, so magical things are suddenly allowed. The laws of the real world are stretched and twisted. "Allen's quirky book with its unconventional heroine may not be for everyone, but any teen who has rooted for the underdog, likes fantasy, and doesn’t need a heroine who is shapely and beautiful, will enjoy it a lot." "Her moving, memorable and rollicking tale of outcast, oversized schoolgirl Tesana, her magical bunny and cast of outrageous but true-to-life characters and situations is one of the best things I’ve read in years. Allen is a major talent, and this amazing debut portends a great career in illustrated storytelling for the ages." "Lively and sharply observed. A very nice effort that rewards the reader with more than a few chuckles." "It’s quick and funny and exciting and just plain good comics. I can't wait to see what she does for Christmas!" "Her black and white artwork is unique and comical. This is a terrific first effort and I look forward to more from Ms. Allen." "Allen has a light touch with her dialogue and a great eye for caricature and grotesquerie in her pen. This isn't a major graphic novel, but it’s a great romp and a wonderful debut." "Allen’s artwork is an extension of Tesana: bold, fantastical and beautiful in its purity." "Has a knack for rendering visually expressive moments."